Citation Information: JCI Insight. 2018;3(12):e91980. https://doi.org/10.1172/jci.insight.91980. 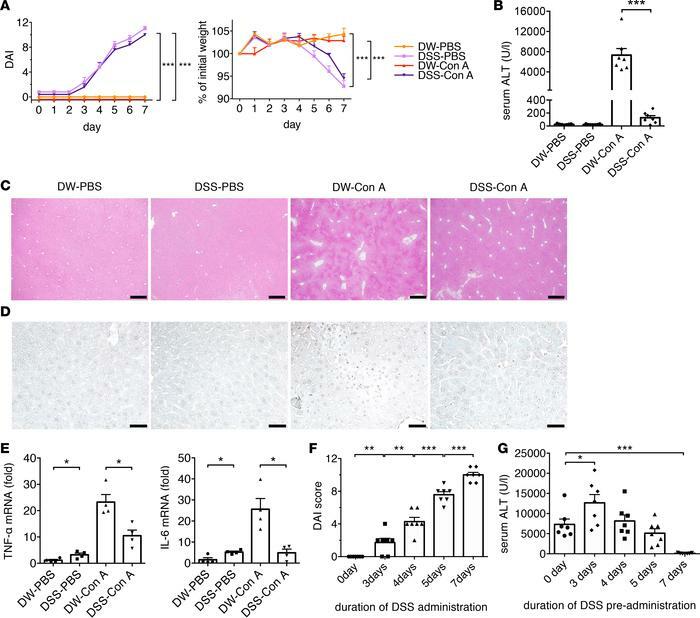 Severe mucosal barrier degradation leads to significantly milder liver injury following a sublethal injection of concanavalin A (Con A). (A) Mice were either untreated or orally administrated 2.0% dextran sulfate sodium (DSS) followed by intravenous PBS or Con A (20 mg/kg) administration. Mean body weight and disease activity index (DAI) on days 0–7 of each experimental group (n = 5–7/group). (B) Serum alanine aminotransferase (ALT) level for each experimental group (n = 5–7/group). (C) Histopathology of H&E-stained sections of liver. Data are representative of each experimental group. Scale bars: 500 μm (n = 5/group). (D) Representative TUNEL assay images of mouse liver sections from each experimental group (n = 5/group). Scale bars: 50 μm. (E) Expression of TNF-α and IL-6 mRNA in whole liver cells (n = 4/group). (F) DAI for each duration of DSS administration. (G) Serum ALT levels after Con A injection for each duration of DSS pretreatment. Data represent means ± SEM. *P < 0.05, **P < 0.01, ***P < 0.001 according to 1-way ANOVA with Tukey’s multiple-comparison correction.